We can only hope that his counterparts in Mexico and Canada can keep the three countries from entering into a recession that could rival the Great Recession. As we covered yesterday, we're talking about $1.2 trillion in total imports and exports -- or roughly 5.5% of total North American GDP. That would be an unprecedented loss. Up next, on his way to his hair appointment at 6:30AM, Trump began his MOAT: the Mother of all Tweets. One can only assume there was a carbon monoxide leak in his limo because that Tweet isn't even remotely based in reality. Let's see what happened after his combover. Clearly instead of preparing for his meeting with Macri, he found it more useful to keep telling lies about the Democrats. It makes sense, mining is the smallest sector of our economy, so he has to look out for them. And those awful Democrats are refusing to join the Republican majority in approving Trump's budget so that means healthcare will not be funded. But wait, don't Republicans have majorities in both chambers? Doesn't that mean they can do what they want with the budget irrespective of the Democrats? Seems like Trump's still in fantasy land. Now that we're just an hour away from his meeting with Macri, he definitely must have put his phone down, right? The gall of that last Tweet in particular is amazing. Recall that yesterday he signed an executive order that was the first step in stripping two dozen national landmarks of their protected status. 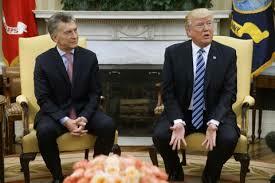 No wonder by the time Macri arrived, Trump was absolutely confused by their discussion. The look of a baffled old man.